I was just so excited about the feedback I got from the Book Chat yesterday! I'm having my first giveaway! 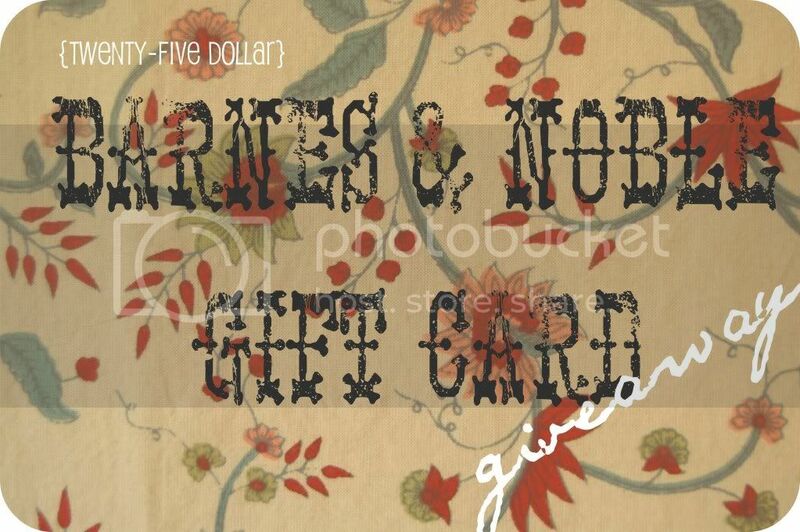 That's right, $25 toward whatever your book-loving heart desires! And for a whopping 5 entries, link up with next Thursday's book chat (3/8/12)! Make sure to leave a comment below for each entry. Fine Print. Giveaway is open to all. No purchase necessary. A winner will be chosen using random.org on Sunday, March 11, 2012 at 12am CST. The winner will be emailed and if they do not respond, I will harass them until they do. I follow you on Twitter and just tweeted you! And I will most DEFINITELY be linking up for book chat next week, I had so much fun doing it yesterday and I'm super excited for next Thursday's question. Im a follower! And per your post today, fat tire on tap is one of my favorite beers. I also love their Ranger IPA! yay! i happily follow you via gfc! I follow you on gfc and twitter -thanks for the opportunity! you can reach me at rachwinga@gmail.com. thanks! I already followed you on Twitter (mcstroup), GFC and in my Google Reader haha, but I just added you to my Bloglovin' as well! And I can't wait to participate in next week's Book Chat! I follow you via gfc as Dee and on bloglovin' :) thanks for the chance to explore new books!